SuperCoco — the voice-driven language learning system that adapts to you. 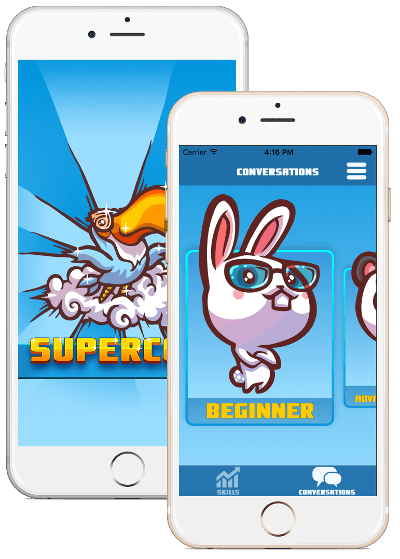 SuperCoco gives you constant practice listening and speaking—you develop real conversational skills. Our unique adaptive system provides “training wheels for Spanish,” so that correct patterns of speech become ingrained almost without effort. Wondering how to find time for Spanish? With SuperCoco you can learn Spanish while doing other things. On your commute, walking or jogging, doing chores—any time you could be on the phone, you can be learning Spanish. SuperCoco teaches authentical, practical Spanish for real life. Every conversation tells a story—filled with humor and drama. By learning in context, with real emotions, you remember better and learning is just more fun! In Argentina, it was awesome to get on the bus or take a taxi and realize that I understood what was being said. I’d already learned basically the same conversation in SuperCoco! Very effective. … A powerful learning tool that’s fun, versatile, and easy to use. I’ve studied many languages in many ways and SuperCoco is the most like a tool for just acquiring one. Of course, you have to put in the time—but you just seem to know what to say. I’m still a beginner, but am very pleased with my progress and at how natural it feels. Our writers hail from all parts of the Spanish-speaking world, bringing both language and authentic culture. Interactive lesson and quiz. Por and para seem totally confusing—until you realize it's all variations on the same pattern. Rolling your R's feels impossible—until you know how to do it. And then it's easy. This article gives a series of simple steps—each one very easy—and by the end, you'll be rolling your R's like a native. Learning Spanish, Italian, Russian, or Arabic? The rolled R is the sound you need! Whenever you encounter a language feature that can't be directly translated—and therefore seems exotic and perhaps, incomprehensible—look for an analogy in English. Instantly, the exotic becomes familiar. I never thought I'd enjoy practicing conjugations. But if you do it at the right time and in the right way, it's actually a pleasure. Copyright (c) 2017, Larkwire LLC. All Rights Reserved.